Interior of All Saints Church in Tilney, Norfolk. 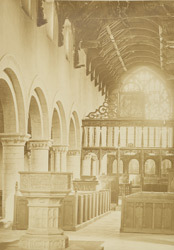 "The plan of the church consists of Chancel with aisles extending to its whole length, into which it opens by two Norman arches on each side; a very long Nave and aisles; south Porch; and a fine western Tower and spire. The chancel is very interesting. The east end has lost its Norman windows, and a large Perpendicular one supplies their place, but the side walls and arches are evidently original...The long nave arcade is surmounted by a grand cinque-foiled open roof, one of the finest in the country; the chancel arch is crossed by a quaintly carved Jacobean screen, (date 1618); very good and substantial modern open seats fill the area to the fourth arch; and a curious post-Reformation font rises on ornamental steps in the centre". Text by the Rector of Diss, C R Manning, from the book 'The Fen and Marshland Churches'.